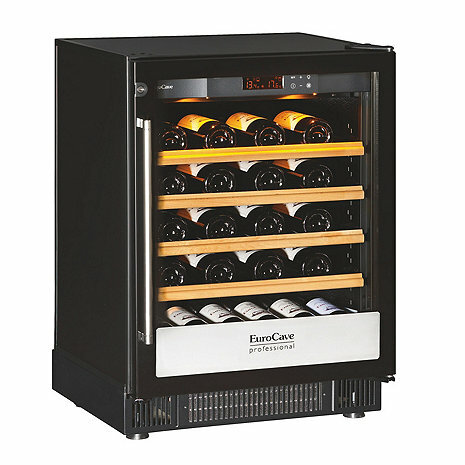 Thanks to its temperature graduated from 5 to 22°C , this multi-temperature cabinet is ideal for the service of your wine. It has a temperature graduated from the top to the bottom, ideal for storing all of your bottles at a perfect serving temperature within one same cabinet. This cabinet model from EuroCave Professional's Series 5000 Compact range , was designed to meet the requirements of small spaces. Thanks to its compact size, it easily fits into the most limited spaces. The Premium pack is made up of 4 sliding shelves for a capacity of 38 bottles. It is possible to add extra shelves, notably display shelves, available individually. Ideal ventilation - it is essential to ensure there is sufficient air circulation or mold and bacteria could develop. *A Note About Bottle Capacities: Wine Enthusiast's stated bottle capacities is always based off of storing all standard Bordeaux size bottles, which are generally 12" H and 2 7/8" W. 750 ML bottle sizes can vary greatly in both height and width, so be sure to check the bottles in your collection as larger bottles (i.e. Pinot Noir, Burgundy, Syrah, Champagne, etc.) will lower capacity. If up to 50% of your collection consists of these taller/wider 750 ML bottles, capacity can be lowered by 10-15%, if over 50% of your collection consists of these taller/wider 750 ML bottles, capacity can be lowered by up to 25-30%. does it also come with a right side opening? The door can be switched to either side but mine opens from left to right. I believe you can specify how the door should open when ordering. I need a wine cooler that is 18" wide under counter. Is there any product like that? Is this unit equiped with humidity control? BEST ANSWER: Yes, all Eurocaves maintain humidity. If you have further questions, please contact us at 1-800-356-8466. Do any of the Eurocave models come in silver trim rather than black? BEST ANSWER: It would be best to discuss the details of your storage needs directly with a storage consultant who can help you determine what unit would be the best option for you. 800-377-3330.